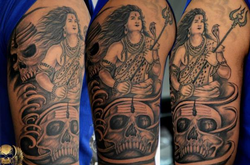 - Creating a tatoo has now became a fashion for all, King Edward with his natural and quality artwork provides best tatoo services for kids and adults. You got a fresh tattoo and you have to take good care of it ! In this scenario, your artist shall not responsible for any infection or problems you may have with your tattoo. if you do not give proper attention to it... A really beautiful tattoo can turn into a disaster if the proper aftercare is not taken. Full colour tattoos becoming one of the most popular among every generation. We also make a Full colour tattoo, design and all things.